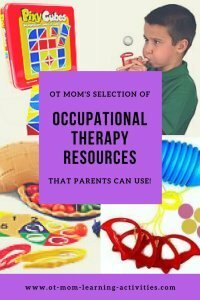 There are a wide range of occupational therapy products and resources that can be used by parents, teachers and therapists at home or at school. I have chosen these OT resources specifically to supplement the activities I suggest on my website. Many of the links below are affiliate links (from PFOT, Amazon and others) and I receive a small commission if you purchase a product through my links. However, you are under no obligation to purchase anything! I only link to products that I have used, or that are very similar to ones I have used. I have partnered with Pocket Full of Therapy (PFOT), who supply therapists and parents with all kinds of therapy products. Many of these products have been featured or recommended on my OT Mom website and e-books, and PFOT have allowed me to compile my favourites on some pages of their site. Click on any category link to view a variety of specifically chosen resources that I recommend in that category. You may find my article on Pencil Grips for Kids helpful if you are looking specifically for pencil grippers. Sometimes a child needs a little extra motivation to work on certain skills. These kids can sniff out a "therapy activity" from miles away, and while they may engage with you on the activity for a short time, they don't exactly seek it out in their "play" time. So sometimes you need to provide toys that are motivating enough for your child to play with of their own accord, while still building skills. These are links to my reviews of a couple of toys that really hit that spot.